With good organisation students can take on the challenges of a new term with confidence and be more productive. As the summer days begin to get shorter and we move towards the last few days of the holidays, minds turn to returning to school and students and parents alike start thinking how to make the most out of the upcoming academic year. Research indicates that starting a new term is the most stressful time of year with new subjects, new teachers, new classrooms and sometimes a completely new school or university. There is a lot for a student and parents to get their heads around. The key to good time management and a stress-free start to the term is to get organised. With good organisation students can take on the challenges of a new term with confidence and be more productive. Through allocating times in the day to complete homework tasks or revise, a student is creating a structure for work and play. By creating a strong order in which to do things a student won’t be panicking on a Sunday night, scraping together quotes for their English essay due the next morning. They will instead be enjoying some well-deserved down-time. Good organisation starts with a planner and this can take many forms. Ryman Stationery has a huge range of planners and other supplies to help students get on the right track for the new term. The three most popular planners at Ryman are the academic diary, the wall planner and the bullet journal. Ryman has a wide-range of academic diaries to choose from, covering both day-to-view and week-to-view, covering the full school year. The Ryman Soft Cover Week to View Mid-Year Diary (£5.99) will help to manage assignment deadlines and homework tasks. The Ryman Blue Floral Page a Day Mid-Year Diary (£8.49) will provide a bit more space to release ideas visually and organise them on the page. As for the parents, the Mums Big Family School Year Diary (£18.50) will help keep track of all the assignments and social obligations of the family, ensuring the whole family are well organised for the school year. Wall planners allow you to see a whole year’s worth of key dates and deadlines, making it easier to plan ahead. The Ryman Academic Wall Planner for 2018-2019 (£4.99) is ideal for university students to keep up to date with important deadlines. The Tallon School Year Organiser (£4.99) will help parents to manage the school kids throughout the year. 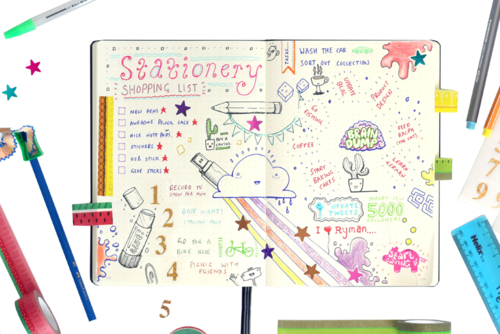 The Notes to self-weekly planner and gel pen (£9.99) will help students stay organised. Whether rushed off their feet with coursework, fitness regimes, chores or just day-to-day life the weekly planner will allow student to jot reminders down to get them ahead of the game. Bullet journaling is a huge trend in organisation and time management allowing students to express their creativity whilst being organised. Product designer and inventor Ryder Carroll’s Bullet Journal is proving the popularity of modern time management. There are lots of books and online resources to help you bullet journal like a pro. As a start check out Ryman’s handy guide to bullet journaling for students. The How to Bullet Journal Book (£9.99) will have you journaling in no time. The Creative Journal Bright Colours Bundle (£29.99) has everything you need to get you bullet journaling. Or if you prefer your journal in shiny metallic colours, try the Metallic Creative Journal Bundle (£29.99). The key to organising time effectively is making sure that you make the planner essential to you. Put everything in it and read it on a daily basis. It will ensure that no vital deadlines get missed. Use the planner to store your timetable. It’s the perfect space to place all of your classes and stay on top of your time. Make it look it exciting, after all you will be looking at it for most of the year. Decorate with highlighters such as the Stabilo Boss Pastel Wallet (£7.99). Or add some personal craft elements with Ryman Stars (£1.49). It is important when starting your new class to get all the key dates of important assignments and tests written in, so you have plenty of time to prepare. A brilliant way to get on top of things is to create a colour code, such as red for exams, blue for coursework, green for reading etc so you know how much time is required. The Paper Mate Inkjoy Gel Pen Pack of 10 Fun Colours (£19.99) will be the ideal tool for creating a calming code. Another great way to organise time is through outlining the tasks you need to complete to keep control of your school projects. Rather than worrying about what to research for your Geography presentation project, brainstorm your ideas with a mind map and simplify it into clear bullet points. The WLLT Sticky Notes Set (£8.99) will provide a great variety of ways to display your ideas. It is helpful to make a new to-do list every week to make sure no assignments fall by the wayside. Make it interesting, use different colours and look to add different layers. Write on coloured card such as Ryman Art Card (£5.99). It will help to make your list standout. Attach it to your planner with this MT Polka Dot Washi Tape (£2.99) to create something stimulating to look at. By simply adjusting the way tasks are planned, the transition into the new year will be smoother and students will sail through. This press release was distributed by ResponseSource Press Release Wire on behalf of Ryman Stationery in the following categories: Children & Teenagers, Men's Interest, Leisure & Hobbies, Women's Interest & Beauty, Education & Human Resources, Retail & Fashion, for more information visit https://pressreleasewire.responsesource.com/about.